It has been a while since I last posted. I’ve taken on a number of large projects lately, including serving as a Coordinating Lead Author for the next Assessment Report of the Intergovernmental Panel on Climate Change (IPCC). This project started in January and will run into 2021. I’m working with a team of scientists from around the world on a chapter entitled ‘Health, wellbeing, and the changing structure of communities’ for the Impacts, Adaptation and Vulnerability report (also known as the Working Group II Report). - What factors determine global climate? - What are the greenhouse gases and why are they increasing? - Which gases are the most important? - How much do we expect climate to change? - Will the climate of the future be very different? - Has man already begun to change the global climate? - How much will sea level rise? - What will be the effect of climate change on ecosystems? This report, along with a short update published two years later, was used as the scientific basis for negotiating e the UN Framework Convention on Climate Change UNFCCC at the Rio de Janeiro Earth Summit in 1992. Signed by roughly 200 nations, including Canada, Russia, the US and the EU, signatories to the UNFCCC pledge to track and report their greenhouse gas (GHG) emissions, take action to avoid dangerous concentrations of GHGs in the atmosphere, and to assist vulnerable countries in adapting to the impacts of climate change. They also meet every year in late November or early December to discuss ways of moving forward; these meetings are called Conferences of the Parties, or COPs for short. Twenty-seven years on, GHGs continue to rise at alarming rates, and vulnerable countries have little more adaptive capacity now than they did then, but at least governments are still meeting each year, and some are actively trying to do something about it (shout outs to Germany, Switzerland, and the Scandinavians here; raspberries to Canada and the US). Let’s get back to the IPCC. In the background, the IPCC has continued to publish its assessment reports every six years or so, and receiving in 2007 the Nobel Peace Prize for its efforts. It has now started its sixth reporting cycle (simply called AR6), and it maintains the original report structure: a report on the physical science, one on impacts and adaptation to climate change, one on mitigation (i.e. how to reduce GHG emissions and avert dangerous impacts), and a Summary for Policy Makers. 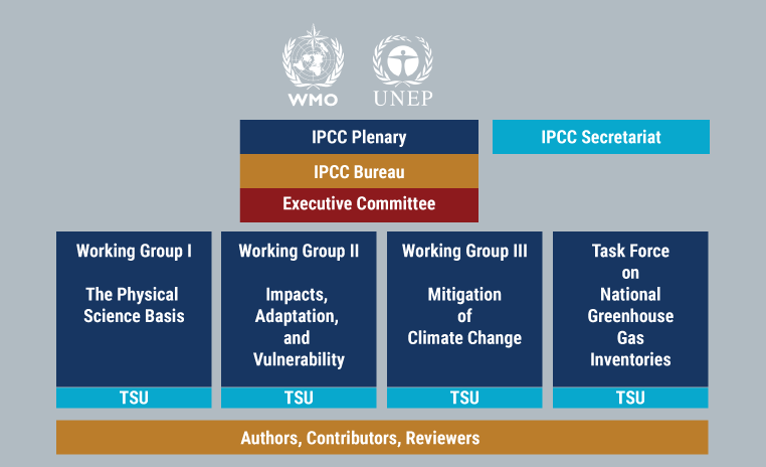 The structure of the IPCC has formalized as well over the years. At its highest level is the Plenary – representatives of the 195 countries that participate in the IPCC process. Below the Plenary is IPCC Bureau that runs the operation, consisting of 80+ individuals paid for by the 195 member countries. 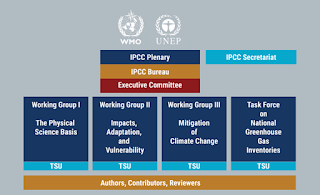 Nested within this is the smaller Executive Committee, which carries out the wishes of the Bureau and Plenary, and below that, three Working Groups that actually do the work of the IPCC, plus the unit that keeps track of countries’ GHG emissions. And within those three Working Groups are the authors (myself included) and reviewers, most of whom are scientists and researchers, all of whom donate their time as volunteers. The IPCC doesn’t do original science; that’s not its role. Through the Assessment Report process, the Working Groups synthesize the key developments and discoveries since the previous Assessment Report. The IPCC is also sometimes tasked by the UN or by the Plenary to carry out targeted research synthesis reports, such as last year’s report on the differences between a 1.5oC and 2oC warming over pre-industrial average global temperatures (it turns out, there’s a substantial difference in terms of bad things that would happen; at the moment, we’re on track for at least a 2oC warming this century; the UNFCCC’s Paris Climate Agreement would like to keep us to1.5oC warming). At this stage, of the process, my fellow chapter authors and I are busily working on a first internal draft of our chapter, which will be submitted in April to the Chairs of our Working Group. Our internal draft will be reviewed by a number of experts in the field, and we will use their comments to make sure we’re on the right track, that we’re addressing what needs to be addressed, and to guide us in creating our first formal draft that will be prepared and reviewed later this year. We did not start from scratch; the title of our chapter and a number of bullet points and more detailed instructions were provided to us, and these were generated at a scoping meeting in Addis Ababa in 2017, which I attended. 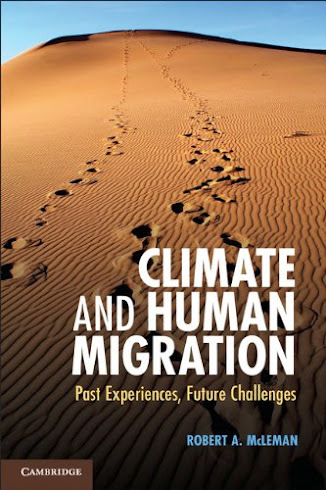 The ‘health and ‘wellbeing’ parts of the chapter title are self evident; the ‘changing structure of communities’ part looks at climate change impacts on demographics, migration, and conflict. How does one get to be an IPCC author? Member countries nominate individuals to the IPCC Bureau, who then makes selections based on the expertise of the authors, with attention to achieving a mix of scholars from developed and less developed countries, a gender balance, and good regional representation. A year or so ago the Government of Canada asked for potential volunteers, and selected a small number of these to be nominated to the IPCC Bureau. We don’t get paid by the government – we are volunteers – with the government picking up our expenses to attend IPCC meetings a couple times a year. My employer, Wilfrid Laurier University, indirectly subsidized the IPCC process this past semester by giving me a course release to work on AR6 in addition to my ongoing teaching and research. It is a very time consuming process, and could easily become a full-time occupation of its own. The biggest subsidizers of the IPCC are the families of the authors, because that’s who gets neglected on the evenings and weekends when you’re beavering away at a review of how climate affects fertility, or the spread of tick-borne diseases, or so forth. So why do it? At the most basic level, there’s the satisfaction of being recognized by others that you’re potentially knowledgeable and capable enough to do it – although that satisfaction wears off quickly when you’ve travelled a total of 24 hours on three economy-class flights to get to your first set of 10-hour-day meetings. Most of my fellow authors and I are pretty well established in our careers, have tenure, and will benefit minimally from being known to be part of the IPCC process. Most of us, myself included, are doing it because we truly care. We recognize that urgent action is needed to tackle climate change, and that since the IPCC is a key component of international action to which we can make a meaningful contribution, we do it. So there you have my long excuse for having not posted to my blog in a while, and why it might be a while before I make a next posting.